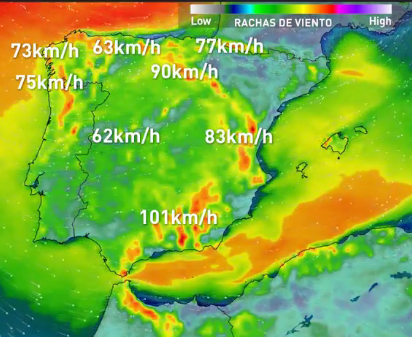 Viento hu­ra­ca­nado este fin de se­mana: ¡Rachas de más de 100km/h! The rains will af­fect al­most all of Spain as a re­sult of a great storm, cal­led Felix, which will be very close du­ring this weekend to our coun­try. The pre­ci­pi­ta­ti­ons will be strong in the west of the pen­in­sula.